MILK STANDS CUSTOM DESIGNED, BUILT, AND MARKETED BY GODDARD FARM. THE UNIQUE MILK STAND DESIGN AND GODDARD FARM, LLC, LOGO ARE CURRENTLY IN THE PROCESS OF BEING LEGALLY REGISTERED FOR US. PRICING AND SHIPPING DETAILS WILL FOLLOW. 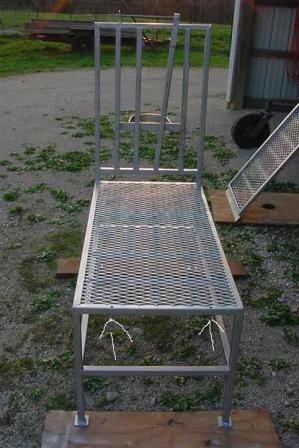 PURCHASE OPTIONS INCLUDE GALVANIZED, PAINTED OR UNPAINTED. VARIOUS PAYMENT MECHANISMS ARE BEING CONSIDERED AND WILL BE ANNOUNCED. PLEASE CHECK BACK FOR PRODUCT AVAILABILITY. PRELIMINARY INQUIRIES CAN BE MADE THROUGH OUR "CONTACT US" PAGE. 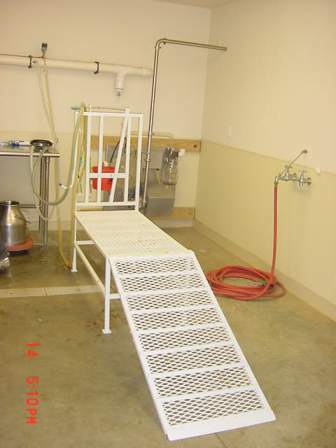 WHEN WE BUILT OUR NEW DAIRY BARN AND CHEESE MAKING FACILITY WE DECIDED TO STAY WITH THE INDIVIDUAL MILK STANDS RATHER THAN SWITCH TO A GROUP STANCHION SYSTEM BECAUSE OF THE DESIRE FOR FLEXIBILITY AND THE ABILITY TO MILK FROM THE SIDE. INDIVIDUAL STANDS ARE EASY TO MOVE AND CLEAN UNDER. NONE OF THE OFF-THE-SHELF MILK STANDS EVER SEEMED TO BE FULLY FUNCTIONAL FOR OUR NEEDS SO WE DESIGNED THE ABOVE-PICTURED GALVANIZED STAND. THE UNIQUE CHARACTERISTICS OF THIS MILK STAND WILL BE EXPLAINED AS WE GO THROUGH THE PICTURES. 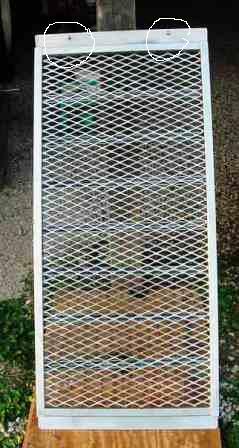 THE MILK STAND IS 22 INCHES WIDE AND 48 INCHES LONG. ONE OF ITS UNIQUE FEATURES IS THE 5 HORIZONTAL CROSS BRACES AT EVENLY SPACED INTERVALS SUPPORTING THE EXTRUDED METAL FLOOR OF THE STAND. 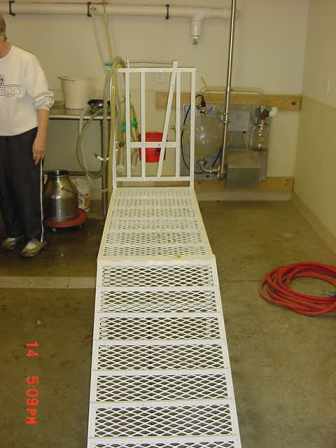 THE DESIGN AND CONSTRUCTION IS SUCH THAT THEY DON'T COLLECT MANURE DURING THE MILKING PROCESS MAKING THE BRACE SUPPORTS AND EXTRUDED FLOOR MORE SANITARY AND EASIER TO CLEAN DURING POST MILKING WASH DOWN. 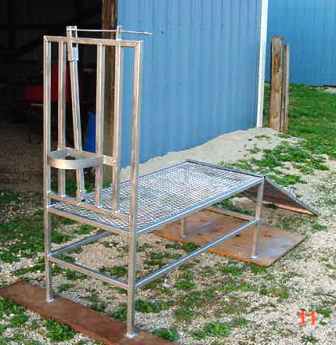 IT IS 20 INCHES TALL MAKING IT TALLER THAN MOST ORDINARY STANDS AND EASIER TO USE WITH LESS BENDING OVER BY THE OPERATOR, WHETHER HAND MILKING OR USING A MILKING MACHINE. 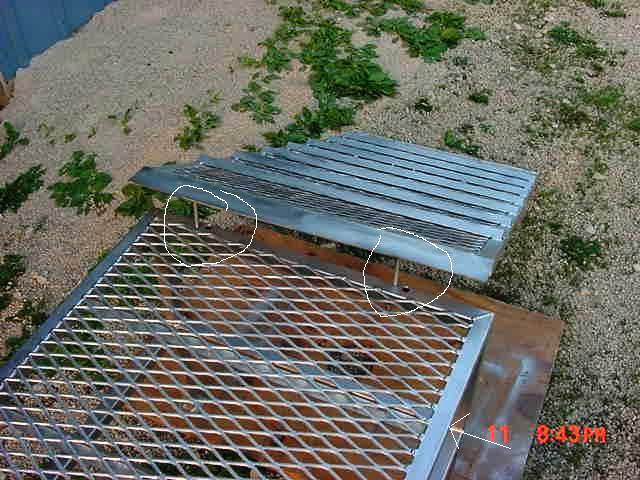 THE RAMP MEASURES 22 INCHES WIDE AND 46 INCHES LONG WITH A 2-INCH FLAP BOTH BOTTOM AND TOP. THE TWO INCH TOP FLAP OVERLAPS AND MAKES THE RAMP ACTUALLY MEASURE 48 INCHES LONG OVERALL. 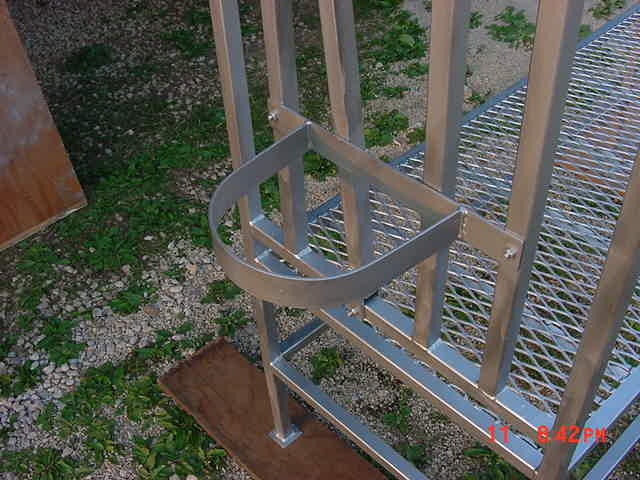 IT HAS 7 CROSS PIECES OR CLEATS EVENLY SPACED TO GIVE THE GOATS TRACTION GOING UP AND DOWN. LIKE THE EXTRUDED FLOOR, THE RAMP IS DESIGNED & CONSTRUCTED TO MINIMIZE BUILD UP OF MANURE FOR EASIER CLEANING AND GREATER SANITATION. 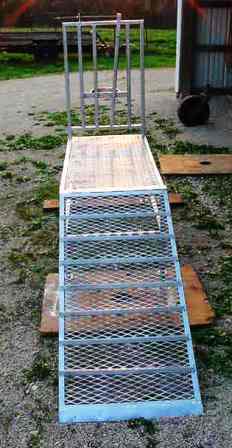 AS CAN BE SEEN IN THE FOUR PISTURES JUST ABOVE, THE RAMP IS CONNECTED TO THE MILK STAND BY TWO 2-INCH PINS WELDED TO THE BOTTOM OF THE TOP FLAP OF THE RAMP. 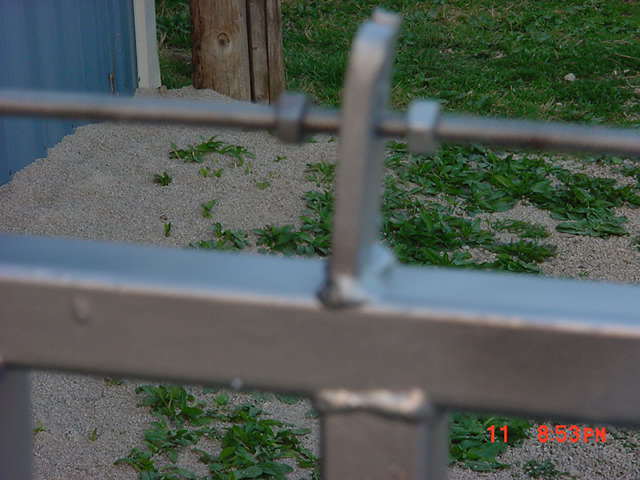 THERE ARE TWO CORRESPONDING HOLES DRILLED IN THE END TOP RAIL OF THE STAND AND THE RAMP SITS ON THE EDGE OF THE STAND HELD ON WITH THE TWO PINS SHOWN IN THE PICTURES ABOVE. 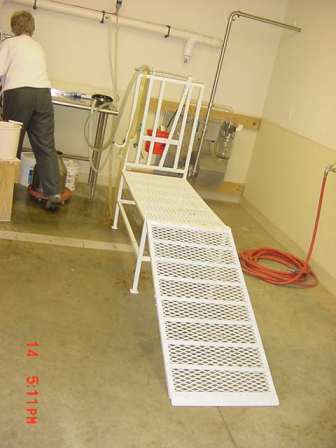 THE USER CAN EASILY LIFT THE RAMP UP TO DISCONNECT IT FOR DAILY WASH DOWN AND EASY CLEANING. 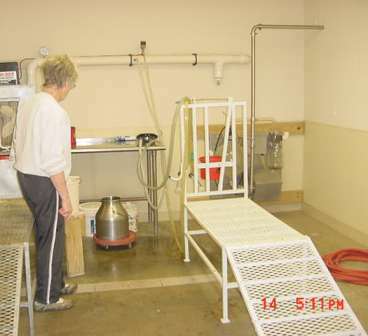 NOTICE THE OUTSIDE HORIZONTAL BRACES ARE POSITIONED FAR ENOUGH ABOVE THE CONCRETE MILK PARLOR FLOOR TO PERMIT ACCESS WITH A SQUEEGE FOR CLEAN UP AFTER EACH MILKING WASH DOWN. 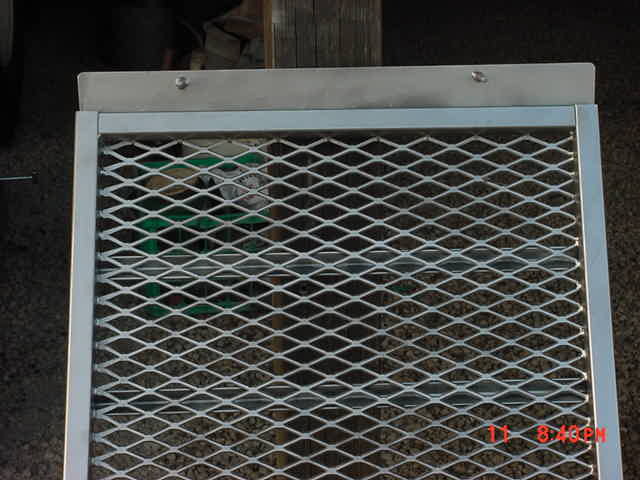 THERE ARE SIX UPRIGHT TUBES, TWO ON THE OUTSIDE, TWO IN THE MIDDLE THAT HOLD THE GOAT'S HEAD, AND TWO IN BETWEEN THAT SUPPORT THE FEED CONTAINER. 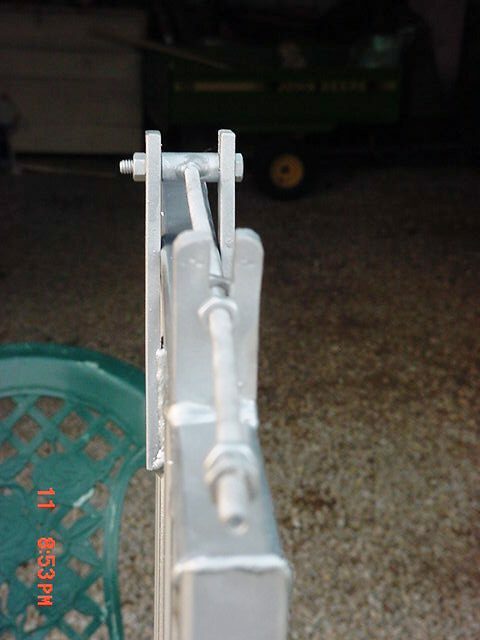 LIKE THE REST OF THE STAND, THE BRACKET AND STRAP, HOLDING THE FEED CONTAINER, ARE WELDED BUT IT IS THEN BOLTED TO THE UPRIGHTS SO THAT IT CAN BE EASILY REPOSITIONED FOR DIFFERENT SIZE GOATS. 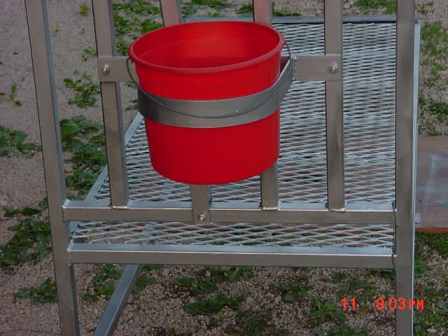 THE BRACKET IS DESIGNED FOR A 6-QUART PLASTIC PAINT BUCKET THAT IS READILY AVAILABLE AT MOST HARDWARES STORES. 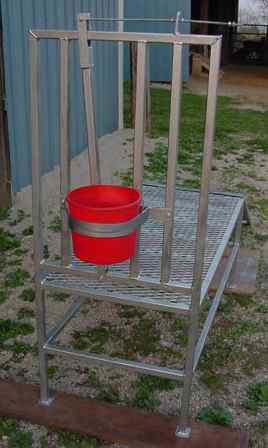 THE HEAD STALL MEASURES 32 INCHES ABOVE THE FLOOR OF THE MILK STAND MAKING IT 52 INCHES TALL OVERALL. NOTICE THAT THE TWO OUTSIDE FRONT LEGS ARE ONE SOLID PIECE TOP-TO-BOTTOM, ADDING TO THE STRENGTH AND STABILITY OF THE STAND. ALL FOUR LEGS HAVE 2 INCH BY 2 INCH DUCK FEET ON THE BOTTOM WHICH INCREASES STABILITY AND KEEPS THE STAND FROM SLIDING AROUND ESPECIALLY DURING THE UP AND DOWN PROCESS ON THE RAMP. THE HEAD LOCK IS UNIQUE BECAUSE THERE ARE NO FIXED DISTANCES PERMITTING DOES WITH SMALLER HEADS TO ESCAPE OR TO BE UNCOMFORTABLE TO LARGER DOES. 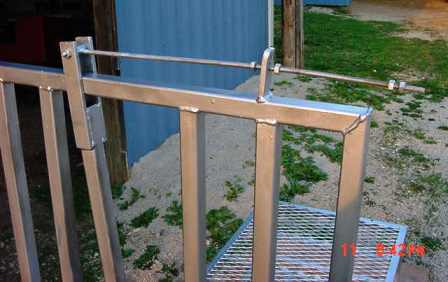 THE HEAD LOCK USES A THREADED ROD GIVING IT AN INFINITE NUMBER OF SETTINGS, ACCOMODATING ANY SIZE GOAT HEAD. THE END OF THE THREADED ROD IS FITTED WITH A KNOB BUT IT SOMEHOW MISSED THE PICTURE.